Oh to be sooooo relaxed as my little pair of chairs! You can check them out in my shop! This is how they got relaxed.... First I had to strip the varnish because it was so bad. Then sand, fill holes with wood putty, sand again, prime, paint in a nice semi-gloss antique white oil based paint. Sand edges to distress the finish and then let them relax while I tackled the seat cushions. They are currently getting a nice polyurethane soak at the spa. Always a good way to unwind. Remove old cover and save to use as a template on new fabric. The cotton batting was so old, first of all it WAS cotton AND it stuck to the fabric! I used burlap because the chairs look rustic to me and therefore I thought a rustic material was in order and tres chic! It really is comfortable for all of yous guys who think, "WHAT THE?!?" Make your piping. 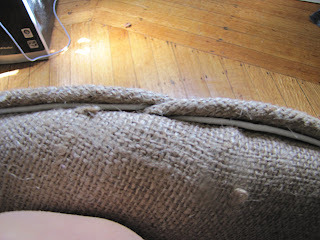 I just used the old piping for length and then cut my burlap on the bias. That means diagonal in sewing talk and it allows you make your piping go around edges easily. I made a double piping using my burlap and then just some store-bought piping. This is it married. See opposites do attract! Here is a little free tutorial within a, oh, yeah free tutorial. Covered buttons. Covered buttons on just about everything make it look custom made vs. store bought so get you button covered ninja on and never look back at plain buttons again. Not that there is anything wrooong with plain buttons! These come in packages so you get all the tools that you need. Then you can just get the replacement supplies for next time unless, you change up sizes like me, in which case you'll have every size tool for covering buttons. Ever. 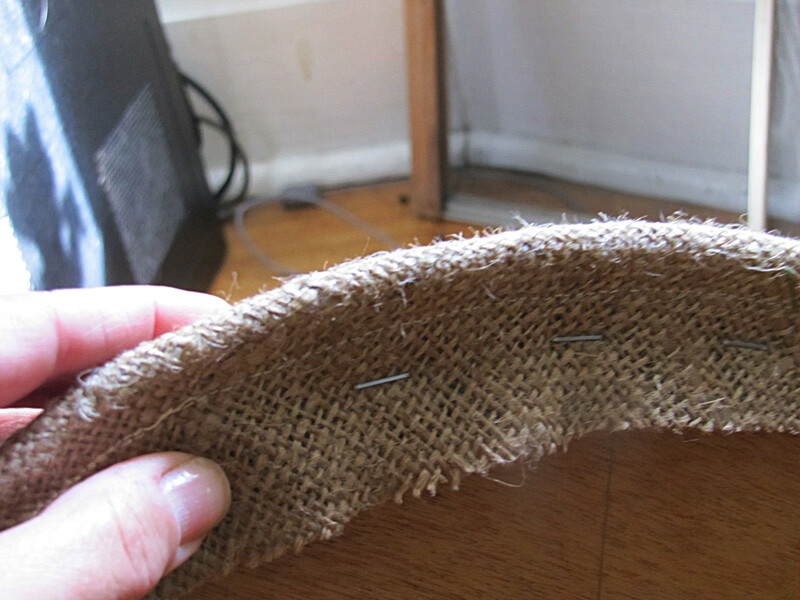 Now, place fabric on the white "bowl" and then press button into it. Pressed but not popped out yet, it can't wait to be put on the seat! Go up through the correct center hole, through the button shank and back down through correct hole. Now PUUULLLLLL! Staple the thread tightly back and forth several times to secure it so it looks tufted. I was not able to take the picture that shows me STANDING on the back of the cushion, pulling, stapling over and over again and trying to photograph all at the same time. But you all have such great imaginations, you get the picture..
And all done, now nail cushion to chair base and sit and relax yourself!!! Now, my little chairs are not de-stressed because they "look pretty" mind you. They had to go through a lot of hard work to get rid of all the stuff that was holdin' them back from their beauty within. Just putting a coat of paint over old varnish would have looked good initially but as people got closer, all the little problems would have become visible and the paint would have started to crack. Absolutely loving this~ your chairs are just wonderful!! Thank you for sharing at Feathered Nest Friday! :) Hope you come share again soon! These chairs are so lovely! The little button in the center is definitely a great touch! This is so adorable, I want to do one myself today! (Wish I had the time!). The button in the middle is the absolute best. I am going to feature it today in my link party. Thank you so much for linking up. Will be posting shortly. Thanks! I'm drooling all over my keyboard! LOVE it! Another great transformation! Kim one question... would you like to guest post for me? I host a Guest Post Blogger every Friday and this Friday is still open, so if you're interested let me know! Glad I've found you girl!